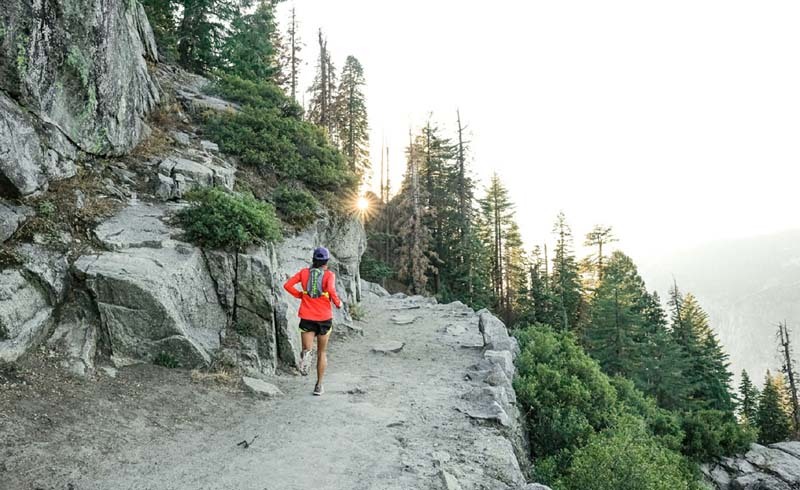 From challenging inclines, to flat, easy and short jaunts, these are the trails to tackle on your next trip to Yosemite. 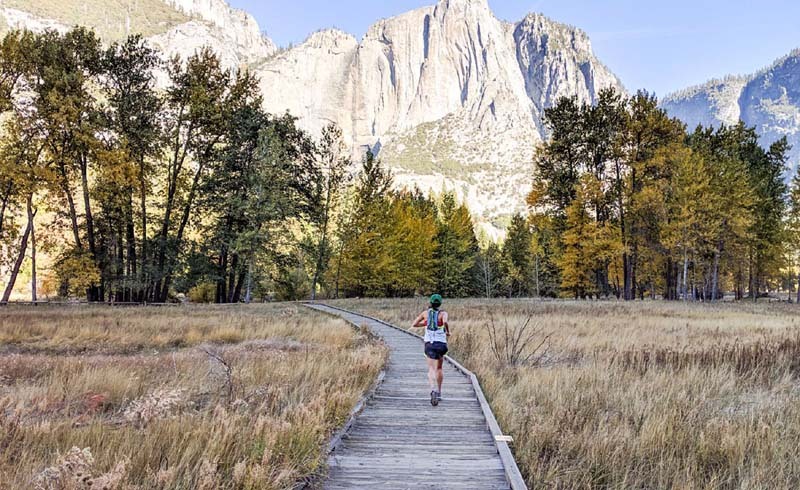 Yosemite National Park is one of the most incredible places to go for a run. There’s elevation, single track, multi-use paths, boardwalks through meadows and numerous places where the view is nothing short of breathtaking. 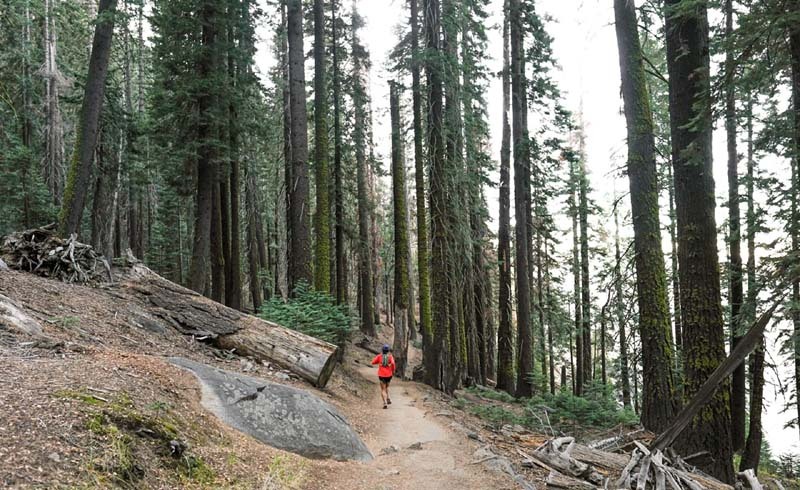 If you’re visiting Yosemite, train hard because the miles and options are seemingly endless. Though the trail is named four mile trail, be prepared for your GPS to show a bit more (it’s roughly 4.8 miles one way.) Many people choose to start from Glacier Point and hike the mostly downhill trail to the bottom of the valley. Those who love a challenge are more than welcome to start from the bottom and work their way up. Either way, you’ll be rewarded with some of the most stunning views of El Capitan, Yosemite Falls, Half Dome and of course, the valley itself. If you choose to run one-way, be sure to have your transportation worked out ahead of time. It’s easiest to have a friend pick you up once you are done. If that’s not an option, there are also buses that run to and from here but make sure to read the fine print and know the details before you go – otherwise, it could end up being a very long run for you back to your vehicle. 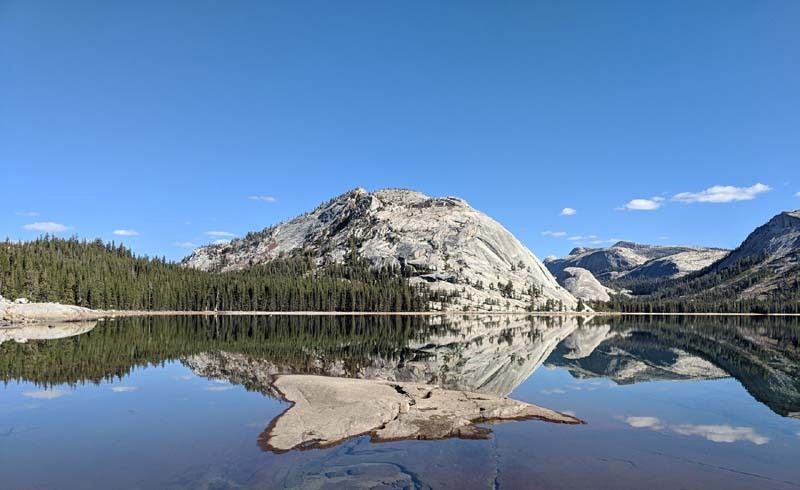 Sure, you could park at Tenaya Lake and see the views from the road, but we recommend parking at Olmsted Point, taking in the spectacular views of Half Dome and then running to the lake. The footing can be super technical in spots and picking your way across the trail will slow your pace down significantly, but there are enough runnable sections for you to turn your brain off and just let go. About half-way to the lake you’ll run through a small but beautiful meadow that turns a golden color during the fall. 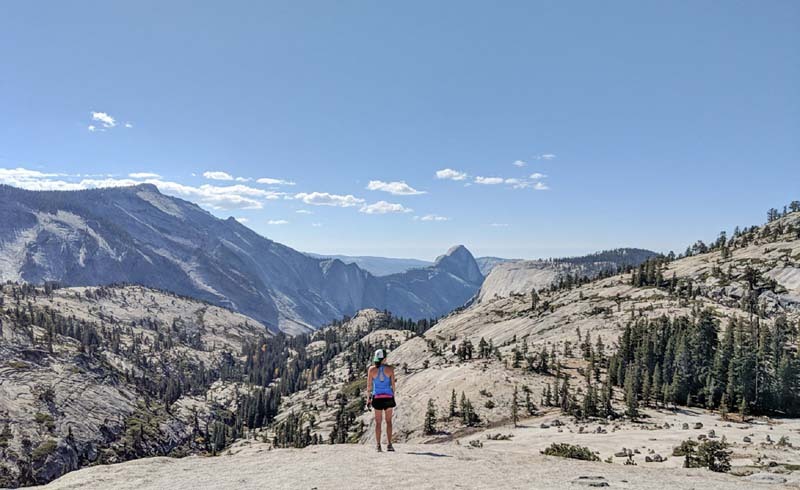 If you’ve got two runs in your legs, continue on past Tenaya Lake (either in your vehicle along Tioga Road or via shuttle bus) or on your own two feet via the PCT and John Muir Trail to Parsons Memorial Lodge and Soda Springs. If you choose to drive, park at the Lembert Dome Parking Area. The run is fairly flat, easy and short – it’s only about 1.5 miles out and back. It takes you past the spot where, in 1889, John Muir and Robert Underwood Johnson discussed how to protect the land that became Yosemite National Park. Look for a small NPS sign that marks the spot. It gave us goosebumps standing there; it’s definitely worth checking out. Note: You won’t find the lodge or the springs on the free map they give you at any visitor center so do your research before you go and carry a more detailed map. 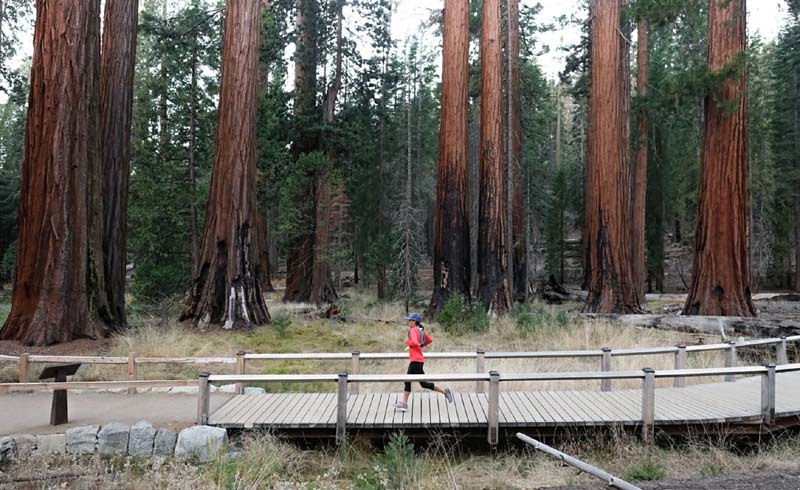 No trail running adventure in Yosemite National Park is complete without logging some miles in and under the Giant Sequoias in Mariposa Grove. There are more than 500 mature trees in this area including the Bachelor and Three Graces, the Grizzly Giant and the California Tunnel Tree. To see each of these trees, run the Grizzly Giant Loop which is about 2 miles round trip. 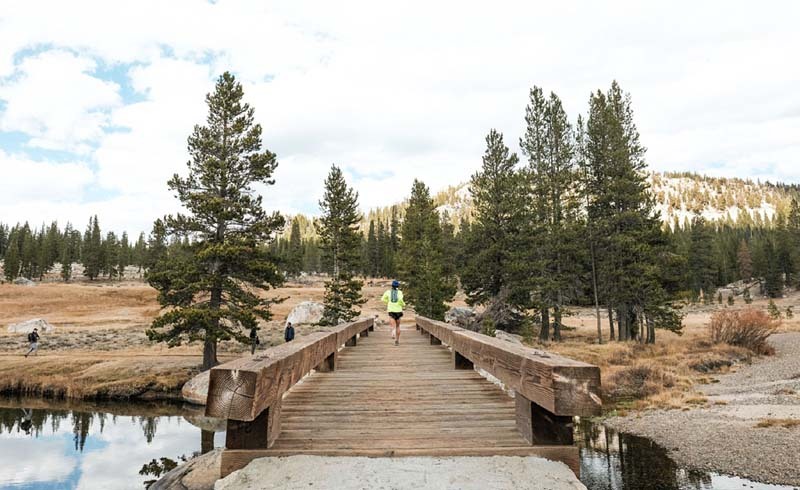 If you want to extend your run, at the California Tunnel Tree, take the spur that connects you to the Mariposa Grove Trail and continue on to Wawona Point. 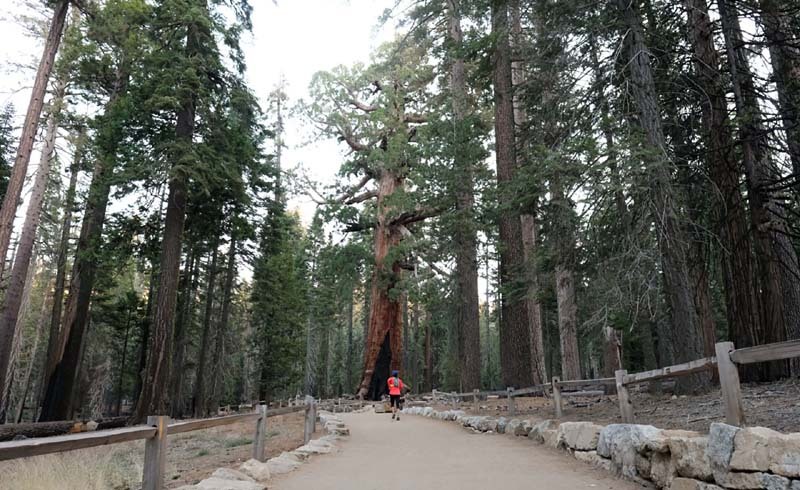 The Mariposa Grove Trail is about 7 miles total but if that still isn’t enough, hop on the Guardian’s Loop Trail for additional miles. The Valley Loop Trail is one of the most popular trails in the park and can be accessed from numerous places within the valley. As such, we recommend getting your run in early. Otherwise, you’ll end up weaving in and out of tourists, photographers, strollers, etc. A good place to start is near the Lower Yosemite Fall area (there’s parking nearby, as well as bathrooms). Most of the trail is fairly flat although there are a few rolling sections that’ll get your heart pumping. Be sure to check out some of the boardwalks that crisscross the valley, allowing you to experience the meadow without damaging it. Check to make sure park roads and trails are open. Tioga Road closes around November and often doesn’t open up until late spring. Stay on the trail. Cutting switchbacks causes erosion and can also be dangerous. Parking in Yosemite can be a headache so when possible, either run to the trailhead as a warmup, hop on one of the shuttles or go early before the parking spots are taken. This is bear and mountain lion country. Be aware and know what to do ahead of time in case you run across either. Take a trail map and navigational tools with you. Do not rely on your cell phone for navigation as many areas do not have good reception. There are often wildfires in Yosemite. Use common sense and avoid areas that are on fire and or that are heavy with smoke.